Madhubani art is practised around Mithila and Madhubani areas of Bihar, India (close to the Nepal-India border). 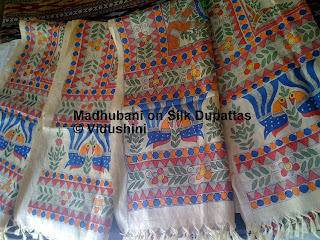 Madhubani literally means "forests of honey" ! Traditionally this art was practised by women only to decorate their huts during religious and important occasions. Nowadays men have also taken up this artform and paintings are done on paper, cloth, canvas etc. But even though women in the villages around Madhubani have been practicing their folk art for centuries, the world at large has come to know about these women and to consider them to be "artists" only in the last thirty years. Even now, most of their work remains anonymous. The women, some of them illiterate, are in any case reluctant to consider themselves individual producers of "works of art" and only a few of them mark the paintings with their own name. 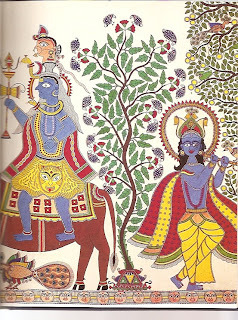 Among the first modern outsiders to document the tradition of Madhubani painting were William and Mildred Archer. He was a British civil servant assigned to the district during the colonial era. The Archers obtained some drawings on paper that the women painters were using as aids to memory. Works that the Archers collected went to the India Records Office in London (now part of the British Library) where a small number of specialists could study them as creative instances of India's folk art. 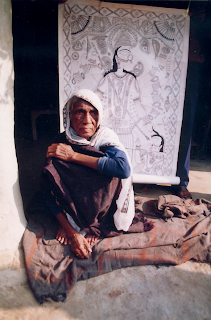 What led the women painters to share their work with the larger world was a major ecological and economic crisis that resulted from a prolonged drought in 1966-68 that struck Madhubani and the surrounding region of Mithila. In order to create a new source of non-agricultural income, the All-India Handicrafts Board encouraged the women artists to produce their traditional paintings on handmade paper for commercial sale. Few women artists who made this artform famous are Ganga Devi, Sita Devi, Shanti Devi, Baua Devi. The colors used were traditionally derived from natural sources like plants, charcoal soot, ochre etc. Black color is obtained by mixing soot with cow dung.Yellow color is obtained from turmeric or pollen or lime and the milk of banyan leaves. Blue from Indigo. Red from Kusum flower juice, red sandalwood or rose. Green from the leaves of apple trees, White from rice powder, Orange from palasha flowers. 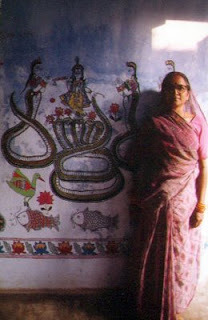 Centuries old, this art is done mainly by the females of the family, and is a part of the daily ritual. It is believed that every morning the gods come invisibly to the household to bless the members of the family and to bring more prosperity. So this art started as a daily welcome painting for the Gods by decorating the outside of the house, the walls or the floor. The walls and floors of the house were coated with cow dung and mud paste. When it dried it gave a perfect dark background to the bright paintings done with white rice paste. The diluted cow dung is also a natural antiseptic which is why it is valued as a floor and wall covering anyway - regardless of whether any one was going to paint on it! 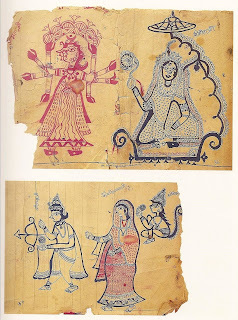 During the Bihar famine of 1964-65 some of these women began to reproduce their pictures on handmade paper as their art work was being noticed by the urban people and the painted walls could not be moved to their living room. In this way, the Madhubani people with help from the All-India Handicrafts Board, have managed to supplement their income by providing a desired product. It is a real life Technology and Enterprise project. To give the same effect to the paper, the artists still coat the handmade paper with a thin layer of diluted cow dung. This helps in the absorption of colours as well as gives the desired shades of colours. Even in the more recent work on paper, the themes are normally the Hindu Gods and Goddesses and stories from Hindu mythology. Initially all vegetable dyes were used for the paintings but today with the changes over time and because of the easy availability many artists now use acrylic colours as well. The figures are recognizable by a face in profile while the rest of the body faces the front. The face has one very large eye and a bumpy sort of nose coming out of the forehead. The figure outlines are drawn as a double line with diagonal hatching between them. The borders are highly decorated - either geometrically or with ornate floral patterns. Clothing also is highly decorated with geometrical, floral or even animal patterns. 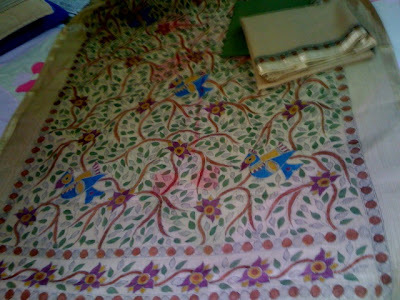 Centuries old, this art is done mainly by the females of the family, and is a part of the daily ritual. It is believed that every morning the gods come invisibly to the household to bless the members of the family and to bring more prosperity. 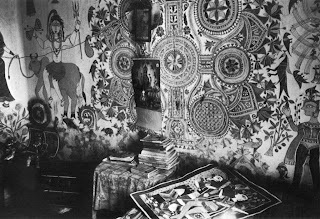 So this art started as a daily welcome painting for the Gods by decorating the outside of the house, the walls or the floor. The drawings of animals are easily recognised for what they are, but again tend to be very stylized. At the Craft Museum in New Delhi, a variety of crafts people are invited for 15 days at a time to come and work in the grounds of the museum so that visitors can watch, ask questions and of course buy their products at a very reasonable price. In this way the visitor is able to experience Tribal Arts from a variety of regions which they would otherwise not be able to visit. The Museum also has many wonderful permanent displays. 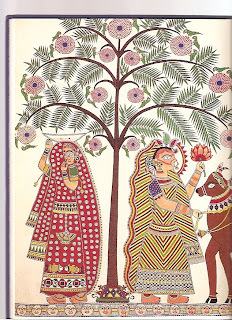 This is an example of a full size Madhubani Wall Painting as it would have been done in the bridal chamber prior to the marriage ceremony. The natural colours were amazingly bright. This is a card bought at the Madhubani stall. It shows the typical facial characteristics and if you look closely enough you may be able to see the textureand colour of the diluted cow dung which has been used to seal the paper. When we did our own drawings in the Madhubani style, we all loved the fineline drawing so much that we didn't want to risk painting them with colours. Mrs Roy did tell us some of the natural materials that they would have initially used to make their dyes. All of these colours are mixed with goats milk or the milk of a bean plant. The brush is a sharpened or flattened twig. black - soot from the bottom of a cooking clay pot or the chimney of a lamp. Interestingly, when we were looking at Aboriginal fibre crafts in Term 1, we found that they also used many different natural materials to dye the reeds and grasses they used when making their mats and baskets. We experimented with the dyeing of raffia at home. Some useful URL's to give you more information about this style of Madhubani Tribal Art and examples of their original work.